Colors of Fall: Are You Traditional or Trendy? Our challenge: the "colors of fall" -choose traditional colors or current fashion colors from the PANTONE Fashion Color Report Fall 2010. I knew I'd never be able to choose between the two color groups so I knew from the beginning I wanted to do two separate designs. The first design would use traditional seasonal colors in Swarovski Crystal with a seasonal flair. The second design would use colors chosen from the PANTONE Fall color palette. 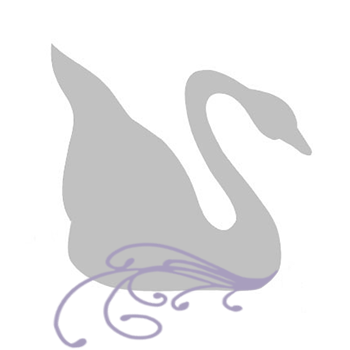 The two colors I chose, which are also my favs, were green (Woodbine) and purple (Purple Orchid). So why are my designs so late? Well, in my initial design indeas, I had decided to give handstamping a whirl. Although, in honesty I didn't quite know how I was going to incorporate this into the fall theme. Then after having received my supplies, it was one interruption after another that began with needing yet another tool and (don't laugh) a fear of handstamping. At first, I figured it was no big deal, but, when it came right down to actually stamping the charms...I chickened out. Once I finally started the design process (for the necklace), you guessed it, the design changed. That caused the need for some new crystals, that I didn't have in stock (of course). So I got those and guess what? Never used them. sigh. I had begun to wonder if I changed the crystal colors as a stall to my fear of handstamping. I finally decided to just jump in and switched gears to start the bracelet, which was to compliment the Green Grossular Garnet Gemstone Hill Tribe Leaf Pendant Necklace (N085). For the bracelet, I wanted to keep with my signature technique of beading. But, as the design progressed, it just didn't give me that "fuzzy" feeling, so I added to the design some chain and wire-wrapping in a three strand style. Then it was time for the metal stamping. You can see at left, attempt #1 resulted in a double stamp of the fern leaf. In my very first shot at handstamping, I stamped the metal, but the image wasn't very good. So I thought the stamp was in the exact same spot and I tried again -Oops! No good. Attempt #2 turned out much better. I did end up stamping it again but this time, I got the metal stamp positioned correctly in the image impression. Attempt #3 shows the last step of the fern leaf metal handstamped charm. The stamped image is further improved upon after having darkened it and buffed it with a pro polish pad. The necklace, as well, evolved from a single strand where the handstamped charm was going to be the "main" charm with the acorn charm right next to it. But that seemed too simple, lacked personality and that feminine touch! So, I decided to do two strands to really showcase the beautiful handstamped tag. It took forever to come up with a 4-5 letter word that would fit on the stamping blank and be tied with the autumn season. But, as I thought about the fall time and how beautiful it is, the first thought that came to mind was a renewal of body, mind and spirit. 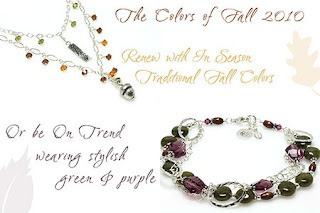 The dangling autumn colored Swarovski Crystals are remininscent of falling leaves (a theme in all my fall jewelry) with an acorn charm that one might find that has fallen from the tree and landed in the pathway. The sterling silver blank stamping tags at Artbeads pair perfectly with both the starter metal alphabet stamps set and fern leaf stamp. Though my designs are late, I am very much pleased with the outcome. Thank you Artbeads! Disclosure: As a Design Partner of Artbeads.com, I periodically receive products, beads and/or components free of charge. I have been asked to review these products and give my honest opinion of the products...positive or negative. I have in no way been compensated by Artbeads.com for my endorsement as it pertains to the products received and reviewed. Hello, I just wanted to say that I really enjoyed your site and this post.Thanks for sharing us. The hand-stamping looks very good. Congratulations on taking the dive! The results were worth it! All I can say is I was extremely busy this season right up until the week before Christmas and to be honest...my creativity seems to have disappeared since the new year!!! Heather -I'm looking forward to seeing what you make with your "found" bag of beads and components! I'm very glad I took the leap in handstamping. It's a fun technique and I look forward to incorporating into more Crystal Allure designs! "I just checked out your blog and beautiful designs. I really love the work on the handstamped pendants, especially with the oxidization. Your necklace is just wonderful with the acorn charm and handcrafted stamped pendant work. I also really like your V-shaped two strand approach in the necklace with all the pretty crystal dangles. You bracelet is just a wonderful play of color and shapes. The crystals, silver hoops, handstamped piece and chain create such a fun and playful piece. These both were wonderful fall designs and I appreciate you creating them. It was truly a pleasure to see your work again."